Minnesota and Wisconsin have been the subject of considerable debate over the past seven-plus years. Ever since the two states parted ways sharply by their respective choices of governors in the 2010 elections, partisans have been claiming that Wisconsin lags progressive utopia Minnesota. But a deeper look at the data shows that Wisconsin does NOT trail Minnesota miserably as some would have you believe, forcing one left-leaning think tank to massage the data to produce their favorable but misleading talking points. The two states – similar in size and demographics, geographically close, and starting from a deep fiscal hole following the Great Recession – are indeed an interesting case study in the fiscal conservative versus fiscal liberal policy debate. Also handy for this comparison is the fact that Gov. Mark Dayton of Minnesota, a liberal, and Gov. Scott Walker of Wisconsin, a conservative, both took office in 2011. Unfortunately for partisan hacks trying to pull a fast one on the mainstream media and the Wisconsin people, there is now plenty of evidence that the conservative fiscal policies enacted under Gov. Walker have pushed the Badger State right past Minnesota since 2011. 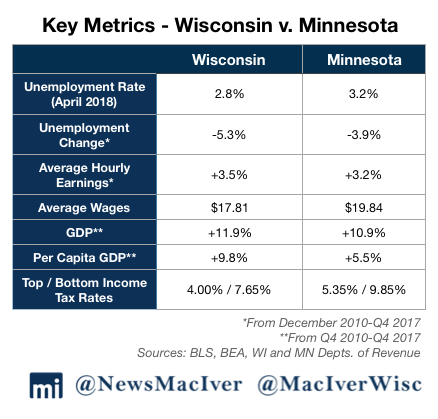 The claim that Minnesota has done better than Wisconsin over the past eight years is simply untrue, a blatant partisan attack buttressed by massaged and cherry-picked economic data. A recent study by the left-leaning Economic Policy Institute claims that Minnesota has outperformed Wisconsin in key economic measures like unemployment and economic growth. “The results could not be more clear: by virtually every available measure, Minnesota’s recovery has outperformed Wisconsin’s,” EPI declares. Closer to home, Citizen Action of Wisconsin executive director Robert Kraig in particular never misses a chance to peddle the canard. The experience of the two states provides, “a complete debunking of the whole conservative economic program,” he told The American Prospect in a May 17 article. EPI arrives at their sweeping conclusion by massaging the data, starting their analysis an entire year before Walker and Dayton took office. The Center of the American Experiment, a Twin Cities-based free market think tank, was the first to debunk the EPI’s claims point-by-point by matching the data to each governor’s actual tenure in office. The CAE report exposes EPI’s sleight of hand. EPI’s data starts with Wisconsin’s peak unemployment rate (9.2 percent) in January 2010 and Minnesota’s peak (8.1 percent) in June 2009. But comparing the two states from the same starting point – December 2010, the month before both governors took control – Wisconsin has clearly outpaced Minnesota in reducing unemployment. In that month, Minnesota’s unemployment rate was a full percentage point lower than the Badger State’s 8.1 percent, and it had peaked six months earlier than Wisconsin’s. But the latest figures show that under Walker, Wisconsin’s rate is now at a historic low of 2.8 percent, 0.4 percent lower than Minnesota’s 3.2 percent rate. Under the policies of a fiscally responsible governor and Legislature, Wisconsin unemployment has dropped by 5.3 percentage points since December 2010. Over the same time, Minnesota’s has dropped by 3.9 percentage points – a 26 percent smaller reduction than the Badger State. The latest numbers, announced last Thursday, see the trend continuing. While Minnesota’s unemployment rate stayed at 3.2 percent, Wisconsin’s dropped again to 2.8 percent. 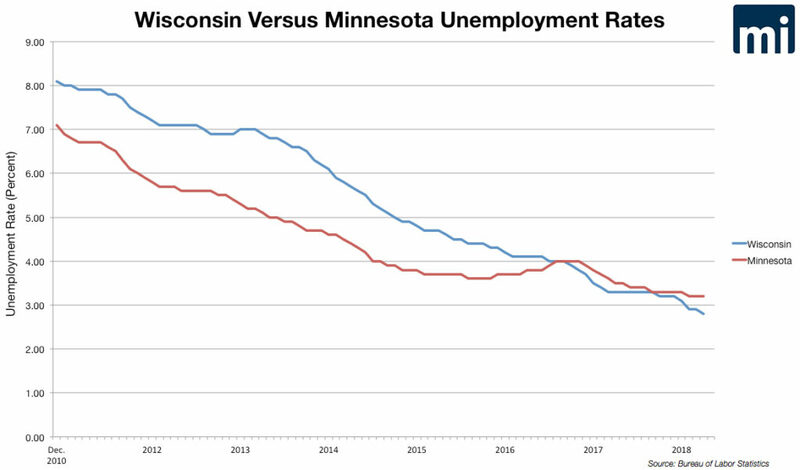 Comparing apples to apples reveals the fact that unemployment in Wisconsin has improved more since 2011 than Minnesota. Less unemployment means better opportunities for Wisconsinites. “Simply put, Gov. Walker inherited an unemployment rate a full percentage point higher than Gov. Dayton did, and has got that down to a rate nearly a third of a percentage point lower. If we’re scoring, this is a clear win for Gov. Walker,” writes CAE economist John Phelan. The suspect EPI study also cites wage data, but their analysis omits key context. Over the period starting in December 2010, just before Walker and Dayton took office, earnings have actually grown faster for Wisconsinites. Average Wisconsin hourly earnings in Wisconsin are up 3.5 percent compared with 3.2 percent in Minnesota, Phelan writes. 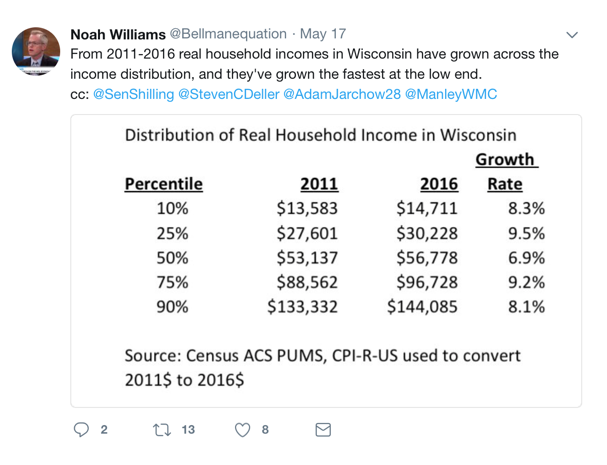 This contradicts EPI’s assertion that, “After Walker and Dayton assumed office…wages in Minnesota have taken off, while in Wisconsin, they have stagnated.” Once again, the liberal advocacy group distorts the truth by focusing on a small piece of the larger economic prosperity picture. It’s true that Minnesota wages – which differs from earnings – are still higher than in Wisconsin. The median hourly wage in Wisconsin in May of 2017 was $17.81, while in Minnesota is was $19.84. Wisconsin clearly has more work to do to pass Minnesota in this measure but recent trends are encouraging. While Minnesota is home to 18 Fortune 500 companies including UnitedHealth, the largest health insurance company in the country, Wisconsin is home to just nine, but the recent decision by Foxconn and Haribo to build their first North American mega plants in Wisconsin is a positive sign. Foxconn and Haribo could have put their facilities anywhere in the country, including Dayton’s Minnesota. But they chose Wisconsin. EPI also tries to conclude that Minnesota’s economic growth has outperformed Wisconsin’s. But as CAE’s Phelan points out, the study again uses data that span all of 2010 and end with 2016 when it could have used a more accurate data set – the fourth quarter of 2010 through the end of 2017. Using that date range, a much more honest picture of the two governors’ tenures come through. 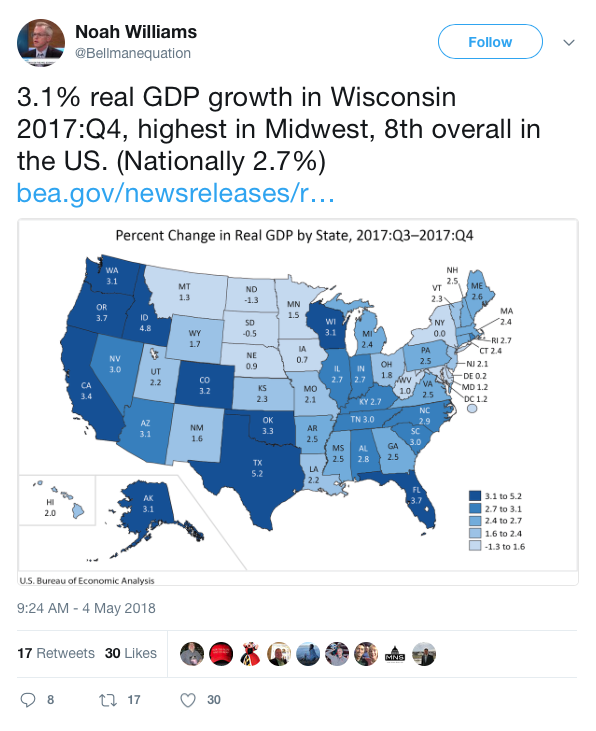 According to Phelan, Wisconsin’s per capita GDP has grown by 9.8 percent, far outpacing Minnesota’s per capita growth of 5.5 percent over the same time period. While per capita GDP is the best measure of economic well-being, overall economic growth in Wisconsin is also greater than in Minnesota – 11.9 percent versus 10.9 percent over the same date range. EPI’s analysis cherry picks the dates it uses in order to maximize its narrative, but the fact is that Minnesota’s GDP has not grown faster over Dayton’s and Walker’s time in office. Not only are Gopher State residents experiencing slower wage and economic growth, Minnesota’s middle class has also taken a beating thanks to the state’s full embrace of Obamacare and its Medicaid expansion. Premiums headed into 2017 were expected to increase by a staggering 50-67 percent, as opposed to Wisconsin’s 16 percent hike. As a result, Minnesota was forced to come up with $300 million to bail out 123,000 struggling Minnesotans who did not qualify for federal Obamacare subsidies. The bloodletting of Minnesota taxpayers didn’t stop there. The following year, the Minnesota legislature spent an additional $542 million to establish a reinsurance program to hold down costs. Wisconsin recently enacted a similar reinsurance program, but the cost to state taxpayers is expected to be a fraction of that, $34 million. Walker administration officials are confident the bill can be paid for by finding savings in the state’s behemoth Medicaid program. Walker and legislative Republicans did the right thing in rejecting a state Obamacare exchange and the “free” Medicaid expansion money, saving taxpayers a fortune. Minnesota, on the other hand, made a costly mistake. And despite the huge difference in costs between the states, a key measure of effectiveness is the same. According to the Kaiser Family Foundation, the rate of uninsured in Wisconsin (7 percent) is virtually identical to Minnesota (6 percent), both below the national average of 9 percent. Progressives concerned about wage earners usually ignore the tax burden, the one piece of an individual’s paycheck politicians have a direct impact on. Another key difference between the states is that Walker has consistently worked to actually reduce tax rates. 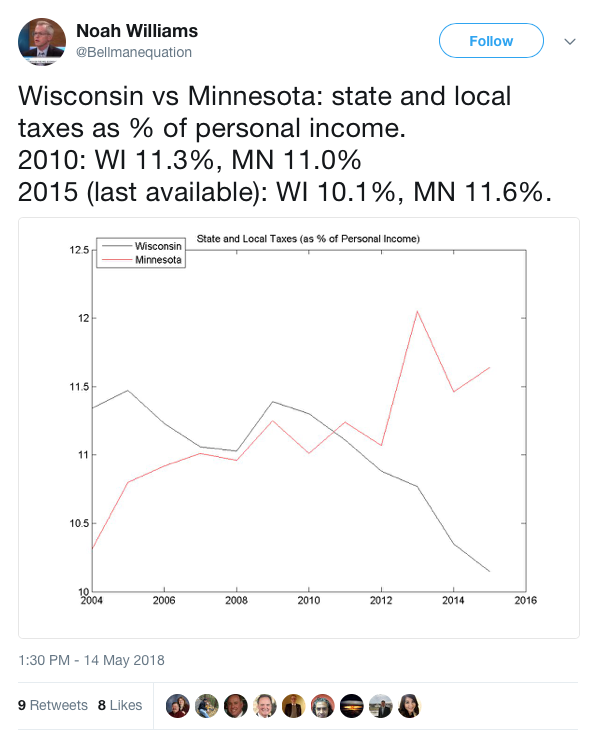 Wisconsin’s personal income tax rates of 4 percent at the bottom and 7.65 percent at the top are lower than Minnesota’s rates of 5.35 percent and 9.85 percent. Wisconsin also taxes middle class income less than Minnesota, and in 2013 Gov. Dayton signed into law a $2.1 billion income tax hike. By contrast, in 2014 Gov. Walker signed a $500 million tax cut into law, and cumulative tax reductions over Walker’s tenure add up to $8 billion. Walker has also frozen property taxes, so the taxes on a median valued home have held steady over his tenure. Seven years after Wisconsin and Minnesota parted ways so sharply, the new Wisconsin is poised for success in the 21st century. That’s clearly evident by the $10 billion Foxconn project, the largest economic development deal of its kind in the history of the United States. Minnesota might have a history of being home to Fortune 500s, but Wisconsin is now attracting major projects while Minnesota looks on. The claim that Minnesota has done better than Wisconsin over the past eight years is simply untrue, a blatant partisan attack buttressed by massaged and cherry-picked economic data. By many measures, Wisconsin is in fact outperforming Minnesota, a trend that’s likely to continue with Walker and Dayton in charge of their respective states.